cast iron | Have YOU Ben Starr Struck? First of all, remember that cooking shows are television, and television isn’t always what it appears! Just because suddenly everyone knows how to make a souffle doesn’t mean they knew how to do that a week before the challenge was filmed. And just because Gordon Ramsay says, “If you can’t fillet a fish, you have no business being in the kitchen” does NOT make that a truism. He may be saying it for dramatic effect. Whether or not you can fillet a fish should depend on whether your family eats fish on a regular basis, and whether or not you have access to quality, fresh, already-filleted fish. 2. How to prep garlic. Along with onions, garlic is one of the most prevalent aromatic ingredients for most recipes. Garlic cloves are covered by a tight skin and are sticky and pungent. One of the best ways to peel them is to cut off the little hard “heel” at the root end, lay the clove on the cutting board and place the knife blade flat on top of it. Rap the knife carefully but firmly with the heel of your palm to smash the clove. The skin will loosen, and you can generally pull it off with one tug. The cut back and forth across the cloves until they are minced…or just place the whole smashed clove in the pot if you’re going to be cooking the sauce or soup for a long time. With regards to that garlic smell on your hands…modern science says that the old wive’s tail of rubbing your hands on stainless steel doesn’t work. But I still do it. I rarely have problems with my hands smelling like garlic. To speed prep, you can buy already-peeled cloves of garlic, whole, at many markets (especially at Asian markets) for very cheap. I do use these sometimes. But avoid those tubs of already-diced garlic stored in water. Their flavor is long gone! 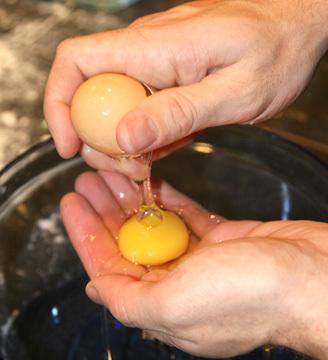 Keep in mind that you should always separate whites one egg at a time, then pour them out of the bowl into your “master bowl.” If you separate all whites into the same bowl, and accidentally break a yolk, you’ve ruined the whole batch of whites. 4. 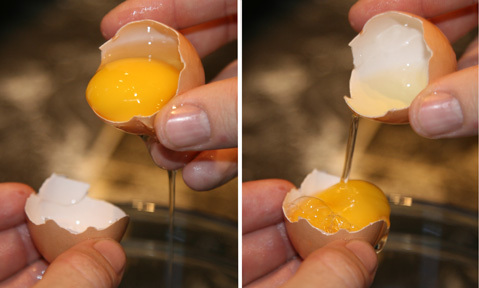 How to beat egg whites. While we’re on the subject of eggs, one of the biggest failures amateur bakers experience is under- or over-beating egg whites for recipes like cakes, meringues, and souffles. For dessert recipes, you can put at least half the sugar for the recipe directly into the whites (whether the recipe says to or not), then begin beating. The sugar granules help stabilize and whip the whites, with less chance for overbeating. Many recipes tell you to slowly add sugar as the whites whip…this is unnecessary. You can add the sugar entirely at the beginning and still have perfect results. For savory recipes, put the salt that the recipe calls for into the whites and then whip. You can also add 1/8 to 1/4 teaspoon of cream of tartar to ANY recipe that calls for beaten egg whites…it will not harm the recipe. The cream of tartar (which is a byproduct of the wine making process) will acidify the whites, and stabilize them for a stronger whip. (A few drops of lemon juice or vinegar will do the same thing, but not enough to flavor the whites.) Beat on high speed at first until the whites turn from yellowish to white, then slow to medium speed as the bubbles get smaller and smaller. Stop often to check your whites. Pull the beater out of the whites and invert them. If the whites on the top of the beater sag over limply, you’ve got soft peaks. If the whites stand straight up into a proud peak, you’ve got stiff peaks. If you beat the whites to the point where they start to separate and look chunky when you stir them, you’ve overbeaten them and your final results will suffer, if not fail. If in doubt, underbeat rather than overbeat! 5. Use the best equipment you can afford. I put this after the whites, because I remember the days using a cheap, little hand mixer to white egg whites. I did this recently in Hawaii when I was baking HUNDREDS of cupcakes and there was no stand mixer in the kitchen. It literally took an hour of beating to get the whites to soft peaks, and I couldn’t get them to go any farther. Getting a Kitchenaid stand mixer was a revelation to me and it dramatically improved my cooking. It was a gift, and luckily it was the Pro 600 watt model…I’ve since used friend’s smaller “Artisan” models, and I have to say, they’re not as good. I’ve also seen people blow out the motors on their Artisans, or on cheap knockoff-brand stand mixers, while kneading bread or rolling pasta. Save up, start a fund and request cash birthday and Christmas presents, and get the best. You will never regret it. This also goes for things like blenders and food processors, which are easy to burn out, and sub-standard models do not render good results. Cut out your Starbucks budget and put that $3 a day into a piggy bank. Spend that on high quality equipment, and you’ll never regret it. Regarding pots and pans and knives, however, you can easily break your budget with all the high-end options available. My vote is ALWAYS for cast iron, which is cheap, lasts a lifetime, and only needs a little extra care than clad stainless cookware. You’ll experience better results on a cheaper cooking surface. When it comes to knives, you can get BRILLIANT quality, full-tang, wood-inlaid handled knives at IKEA for a fraction of the price you’ll pay for German or Japanese knives. Their Slitbar series is of stunning quality, and the 6″ standard chef’s knife is $20. Seriously. 6. Care for your knives. This means honing them on a regular basis (at least once a week) and getting them sharpened once a year. If you’re not comfortable using that big honing bar that you see Gordon Ramsay use like lightning, get a table-top honer. IKEA sells one in their knife section for under $10. You set the knife into the slot and move it back and forth a few times. Honing does not SHARPEN the knife. But that razor-thin edge gets bent as you cut bones and tough veggies, and honing straightens it back out. Sharpen your knives once a year to keep them in great condition. It’s only a few dollars to have a standard knife sharpened. Check a local fabric store to find a sharpener…when you get them sharpened at a gourmet grocery store, it costs a lot more. Also, never ever ever use glass, metal, or hard plastic cutting boards, and never chop directly on your countertop. That’s the best way to ruin your knives. Use only wooden or soft plastic cutting boards. If you can actually sink your knife into the surface of the plastic, that’s what you’re looking for. Those hard melamine cutting boards are terrible for your knives. Use wooden cutting boards only for vegetables and fruits. Meats should be cut on plastic boards. 7. Care for your pots and pans. Some cookware is not meant to go into the dishwater. Read your owner’s manual. If you’re dishwashing these pots and pans, you are decreasing their life. The bottom may delaminate or you may be stripping off the cooking surface. If you’re like me and use primarily cast iron, these can NEVER go in the dishwasher. Hand wash them…you don’t even need soap unless there’s a big greasy mess to clean up. The more you use your cast iron, the easier it will become to clean as it seasons up through regular use. Sometimes when guests see me just wipe out a dirty cast iron skillet with a dry paper towel and put it back in the cabinet, they freak out. “That’s not sanitary! You need to wash with soap and sterilize it in the dishwasher!” What do you think the heat of the stove does, people? If your pan is hot enough to cook something, it is sterile. You just want to remove any actual bits of food on your cooking surface. Cast iron, if you wash it, should be THOROUGHLY dried before being put away. I like to wash it, dry it, then put it on a hot burner for a few minutes to evaporate any remaining liquid. Then I give it a tiny spritz of cooking spray, wipe that around to spread the oil onto the surface, and then put it away. Yes…it takes a bit longer that tossing it into the dishwasher. But cast iron is hands down the BEST cooking surface ever invented, it’s dirt cheap to buy compared to those hundred-dollar pots, and it will last many lifetimes if cared for. And cooking on that cast iron surface will make your food taste SO MUCH BETTER. 8. Measure dry and liquid ingredients properly. This may sound like a no-brainer, but I get lots of questions about how to properly measure. The most correct answer is not to measure, but to weigh. Every serious cook should have a kitchen scale to weigh dry and liquid ingredients, and seek our recipes that measure by weight and not volume. But, let’s face it, most recipes out there call for cups and teaspoons. So the proper way to measure dry ingredients is to scoop the flour or sugar out of the bag or box and into a measuring cup held over the box. Continue scooping until the cup is overly-full. Then rake a flat surface (like a knife or ruler) across the top to level it off. Do not shake or press down (unless the recipe calls for it…many recipes call for a firmly-packed cup of brown sugar). For liquid ingredients, you need a separate liquid measuring cup. I prefer the glass measuring cups because they don’t warp when heated. Get down at eye level as you fill the cup with water or milk or oil, and when the liquid reaches the proper level…stop. Make sure to remove ALL the ingredient from the measuring cup. Ingredients like oil and buttermilk can stick to the walls of the measuring up, and you should scrape it out with a rubber spatula to make sure you’re adding the correct amount. Precision is the mantra for baking. Your recipe can totally fail if you don’t measure properly. 9. Use the microwave…properly. I hate it when food-Nazis say that the microwave has no place in the kitchen. It most certainly does. It is the single best way to melt chocolate and butter. It’s the fastest and most energy efficient way to heat water and liquids in small amounts. It is the best way to reheat some leftovers, and to toast nuts. It can even be used to help bread dough rise quickly if you’re in a hurry. Don’t try to thaw meat in the microwave…ever. Don’t try to cook meat in the microwave…ever. And if you’re reheating meat in the microwave, use a medium or low setting and microwave it for longer, letting it rest for 30 seconds every 30 seconds, so that you don’t overcook it. The microwave and meat do not mix, but otherwise, it is indispensable in my kitchen. 10. Know how to select meat properly. Red meat should have a good amount of intramuscular fat…flecks of white dispersed between the meat fibers. Poultry and pork should be firm to the touch and not yellowish or greenish. Especially with poultry, don’t be afraid of bone-in cuts. Bone-in, skin-on “split breasts” are often less than half the price of boneless skinless breasts, and the bone contributes flavor and moisture to the meat. If you don’t like it, it takes less than 30 seconds to remove that bone. And don’t be afraid of dark meat. The least interesting cut of chicken is the breast. It is dry and has no flavor. Dark meat, while it may have a bit more fat and cholesterol, has flavor and moisture, especially if you cook it on the bone. I haven’t bought boneless skinless breasts in years. Fish should be firm, not dull, and not smell fishy. Don’t be scared of previously-frozen fish. Most fish varieties degrade very quickly after being caught, and in order to have superior texture and flavor, they must immediately be flash-frozen on the boat after the catch. Keep them on ice in your fridge (your fridge isn’t cold enough to store them properly without the ice) until you are ready to cook them. 11. Know when your meat is done. Overcooking meat ruins it. It becomes dry and tough. You can even overcook meat if it’s immersed in boiling water…it can come out of that water dry as a desert. Each cut of meat has an ideal final temperature. It’s far beyond the scope of this blog entry to explain each one. Get a solid meat cookbook, or find an online resource. The most reliable method for determine meat temperature is the thermometer. I keep a remote-probe thermometer around…the probe stays in the meat inside the oven or grill or smoker, but the readout unit stays outside where I can see it easily and keep track of what’s happening. A thermometer is CRITICAL for a large piece of meat like a roast, or a full bird like a chicken or turkey. Don’t cook one without it, even in the crock pot. When you get one of those dry, tough bites of roast from a crockpot roast that’s been simmering in its juices for hours, it can be baffling…but the reason is that it overcooked. For steaks and fish, you can use the touch method: hold your index fingertip to the tip of your thumb. Now feel the pad of muscle at the base of your thumb on your palm. That is how rare meat feels. Now your middle finger…that’s medium rare. Your ring finger is medium. Your pinky is medium well, and no meat should ever be cooked beyond that. Fish should never be cooked beyond medium, and some fish (like tuna) are better eaten totally raw or barely seared. Keep in mind after you remove meat from the heat, it will continue to coast upwards in temperature. So if you want a medium steak, you cook it to medium rare, then remove it from the heat, tent it lightly with foil, and in a couple of minutes it will be medium and ready to serve. Large pieces of meat like briskets and roasts and turkeys can coast upwards a full 10 degrees when you remove them from the heat. Plan for that. 12. Know how to cook shellfish. The most popular shellfish are shrimp, and shrimp are almost always overcooked by both home cooks and restaurant chefs alike. If you’re getting previously cooked shrimp (which look white or pink), they should not be cooked at all. They should be added to the recipe after cooking, and the ambient heat will gently warm them. Raw shrimp should be very minimally cooked. Even 30 seconds too long will turn them tough and rubbery, and a properly cooked shrimp is mouth-wateringly tender and melty. The proper length of time will determine by your cooking method (simmering, sauteeing, frying, etc.) but the rule of thumb is LESS cooking time is best. If your dish will be simmering for a long time (risotto, stew) add the shrimp only 3 or 4 minutes before the end. The same rule holds true for other shellfish, like scallops. Even the largest scallop should only be seared 90 seconds per side…far less for small scallops. And for mussels, clams, and oysters, these barely need any heat at all to cook. Mussels and clams are typically steamed for only 2 minutes, just until their shells open, and anything more will overcook them into rubber. And unfortunately, reheating leftovers that contain shellfish will almost always result in overcooking. You either have to deal with it, or remove the shellfish, heat the dish, and return the shellfish to it just before eating. 13. Manage your heat. This is obviously an aspect of the previous 2 entries, but it involves knowing the temperature of your cooking surfaces. When you preheat your oven to 425F, is it really 425F in there? Or 475F? Most home ovens (and especially commercial ovens) are not calibrated properly. Get yourself a cheap oven thermometer, so you know exactly what your oven temp is. This will give you better results. Your own oven may have to be set as much as 50 degrees lower or higher in order to comply with a recipe. Also, the surface temperature of your pans and skillets is critical, so you’re not over- or under-cooking. Eventually you can learn to gauge heat by holding your palm a few inches above the surface. But until then, if you’re really nerdy, you can get an infrared thermometer online for around $30 which will give you an accurate reading of surface temperature. I like to cook pancakes at 300F. I like to pan fry at 350F. Having control over your temps will ensure that you don’t burn things, or have to cook them so long that they end up dry. 16. How to use herbs and spices. There are 2 types of herbs used in cooking…fresh and dried. Fresh herbs are expensive, but in the case of some herbs like tarragon, parsley, basil, and dill, the dried versions don’t really taste like anything much. So if you come across a recipe that calls for any of the above herbs dried, it’s not a good recipe. Unfortunately, fresh herbs can be expensive. (Check ethnic grocery stores for cheap fresh herbs!) So the best solution is just to keep a few pots of herbs on your patio or porch. Herbs are weeds…they are very easy to grow. Even if you have no balcony, there’s probably a window in your house that gets sun during the day, and herbs can grow here quite well. Fresh herbs have very volatile flavors…they must NEVER be added at the beginning of cooking, or their flavors will disappear. Even if the recipe says to add a bundle of fresh herbs before 30 minutes of simmering, don’t trust it! Add those herbs 5 minutes before the end, and your flavors will be much better. Dried herbs, and spices like cinnamon and nutmeg, are a different story. Their flavors need longer extraction in order to permeate the dish. Pungent herbs like thyme and oregano and sage and bay retain, and even concentrate, their flavors after being dried. But they must be added at the beginning of cooking, often before the majority of the liquid. Adding dried herbs and spices to hot oil will “bloom” them and extract more flavor than adding them to hot liquid. In addition, adding some alcohol (wine, vinegar, or vodka) before adding the stock, water, or tomato juice, will further extract flavors that can only be drawn out in alcohol. 17. How to knead dough. Kneading is a critical component of baked goods. The procedures of kneading vary dramatically, depending on how much gluten you are trying to develop. Gluten is a protein structure in flour that, once you introduce liquid, begins to form a lattice of connections, like a spiderweb. The more you work the dough with your hands, or the longer the dough sits and absorbs liquid at room temperature, the more the gluten structure develops. For yeast breads, that gluten structure must be very connected and advanced in order to trap the bubbles of carbon dioxide produced by the yeast. For pastas, that gluten structure must also be highly developed in order to be able to roll the dough out thinly without it tearing. But for quick breads and pastries, like biscuits or pie crust, the gluten can’t be overworked or the dough will be tough and chewy (like bread or pasta is). So for bread doughs and pasta doughs, knead firmly, and for a long time. For biscuits and pastries, knead very gently and carefully, and only until the dough comes together. Then stop. 18. Know when quick breads are done. Quick breads are any bread made without yeast. Cupcakes, cakes, brownies, pumpkin and zucchini bread, and coffee cakes are all examples of quick breads. It’s common for new bakers to remove quick breads from the oven before they are done. This causes the quickbread to sink in the middle and “fall.” The center will be gooey and underdone, while the edges will be perfect. Your cake can fall if you remove it from the oven, or leave the oven door open long enough to do the conventional “toothpick test.” So your first clue is your eyes…if the cake is rounded and high all the way to the very center, it’s in the final stages of cooking. Open the oven door quickly, and just enough to stick your hand carefully inside and gently touch the very center of the cake or cupcake. If your touch leaves an indentation, it needs to go a few more minutes. If the cake springs back, you can test it with a knife or toothpick. Insert the knife down into the center of the cake and remove it. If it comes back out with streaks of wet batter on it, it’s not done yet. If it comes out totally clean, or with a few dry crumbs, it’s done. The only exception can be brownies, which can be intentionally underbaked so that they are dense and chewy and moist. 19. Balancing flavors. This is probably the SINGLE MOST IMPORTANT SKILL for a cook to have. You cannot ever rely on a recipe to tell you how much salt, acid, or sweetness the dish needs. Never. Virtually all recipes need more salt than they call for in order to be properly seasoned. And many recipes include no acid at all, when they desperately need acid to be properly balanced. More than 1 true master chef has told me that acid is the most important flavor to be mastered. If you taste a dish and it’s missing “something,” the amateur cook reaches for the salt. The master chef reaches for the vinegar or citrus or tomato paste. Every dish needs to have a balance of saltiness, sweetness, and acidity (or sourness or brightness) in order to be perfect. The best way to learn this is to practice. Add a little extra vinegar next time, even if the recipe doesn’t call for it. And not all vinegars are equal…there are mild vinegars, like rice vinegar and malt vinegar…medium vinegars like wine vinegars…and strong vinegars like apple cider. Sometimes only a few drops are necessary. Sometimes, for a big pot of spaghetti sauce, I add as much as a half cup of apple cider vinegar. Boldness in the acidity content of a dish can raise it from a mediocre dish to a stellar dish. But only if that acidity is balanced by salt and sweetness. Many sauce recipes don’t call for sugar, but most of them need it. Or some honey, or agave nectar, or fruit juice/puree. Something to counteract the acidity. Likewise, many dessert recipes do not call for salt, but benefit from some salt. I don’t ever cook a dessert without adding salt to it. Big, bold flavors can result from a generous use of all 3 flavor components, but they must be in balance. If you get your dish too acid, add more sweet. If you get your dish too salty, some acid may help counteract, but it may be in your best interest to dilute it and re-season until it’s right. A peeled potato plus 1/2 cup of liquid can be added to a dish that is too salty to help extract some salt. Some people like to call this a myth, but it does actually work. 20. Managing your time. This is the single biggest challenge for a cook, whether a home cook or a chef. This is why people fail on cooking shows. Managing your time is crucial, and it’s something that only comes through experience. Short order meals like breakfast can be the trickiest. You want your eggs done at the same time that your biscuits come out of the oven, because cold eggs are nasty. When serving a big, complex meal, sit down and make yourself a schedule working from all the recipes, so that you know exactly what time to bake the pie or the bread, put in the casserole, saute the asparagus, etc. Take advantage of dishes that can be cooked ahead and held at temperature, or chilled and then reheated, like mashed potatoes or soup. I make schedules for EVERY dinner party I host. Of course, this is a list I threw together quickly, and I’ve probably missed some crucial items. Please feel free to list your own must-have skills in the comments below, or critique my selection!